It is time for Tuesday Stretch. The sets of everything in carnival glass that we have been seeing are awesome! Thanks to everyone who is sharing pics of their collections. I will be picking up on the “sets” theme tonight and will be sharing some photos of my personal stretch glass. Unfortunately, I don’t have the time to take all of my sets out of my china cabinets and set them up for proper photos. So, I’m going to show you some sets using less than professional photos but I’m also going to borrow some photos from Dave and Renee’s vast photo library to go with my ‘casual’ photos. 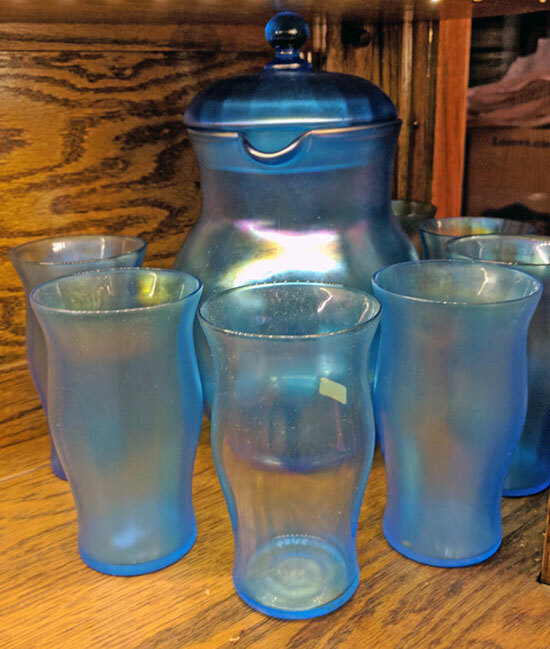 I am a set collector…I’ve never been satisfied to have a pitcher and 1 tumbler; I want 6 tumblers for each set. And if there are coasters for the tumblers and a base for the pitcher, I want those also. Wanting and having are two different things. For the most part I’ve been successful in getting the 6 tumblers or mugs to go with my pitchers. Getting the bases and coasters is a different story. I have some but am always looking for more. Keep in mind that the bases for the pitchers with the cobalt handles are also supposed to be cobalt glass – those are tough to find. 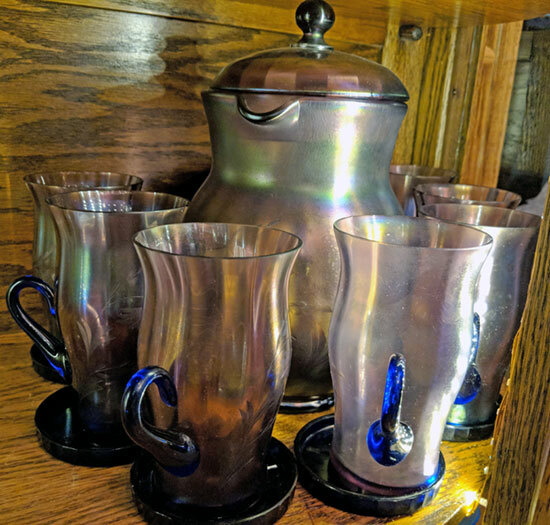 In addition to cobalt coasters for the mugs with cobalt handles, there are clear coasters for the mugs with clear handles which go with the pitcher with a clear handle and there are pink coasters for the Velva Rose tumblers. I also have marigold coasters which I use with the Grecian Gold tumblers but I am not certain the coasters were made by Fenton in the period. In the end, we use what we have and keep looking for more. Ok, on to the photos. We will start with a set which has still not been 100% attributed to a manufacturer but seems to have been made by Fenton. 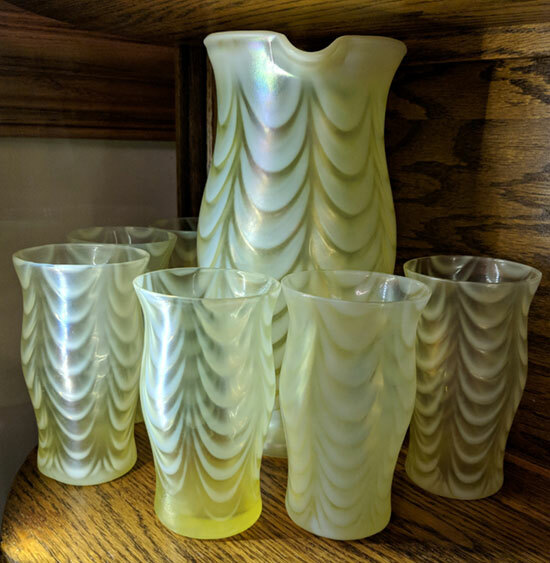 I am leaning toward Fenton due to the color of the green glass; it is more similar to Florentine Green than it is to Diamond’s usual green. But the shape is unusual for Fenton, so the mystery continues. These pitchers are hard to come by. I’ve somehow ended up with two of them and they are nearly identical. 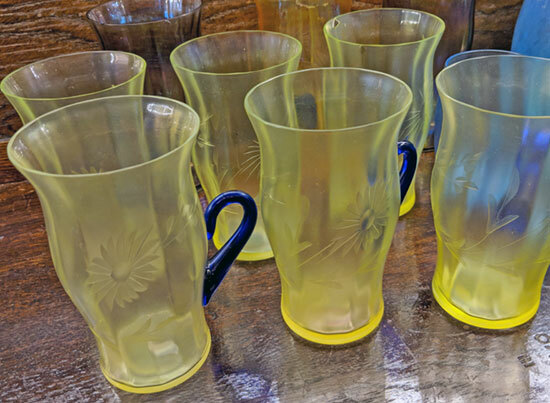 I pair them with straight sided tumblers – no guarantee they were sold with those tumblers, or with any tumblers, for that matter, as I am not aware of any catalog pages which document the pitcher. Let’s stick with Fenton sets and look at the two shapes which are typical and well documented as Fenton. 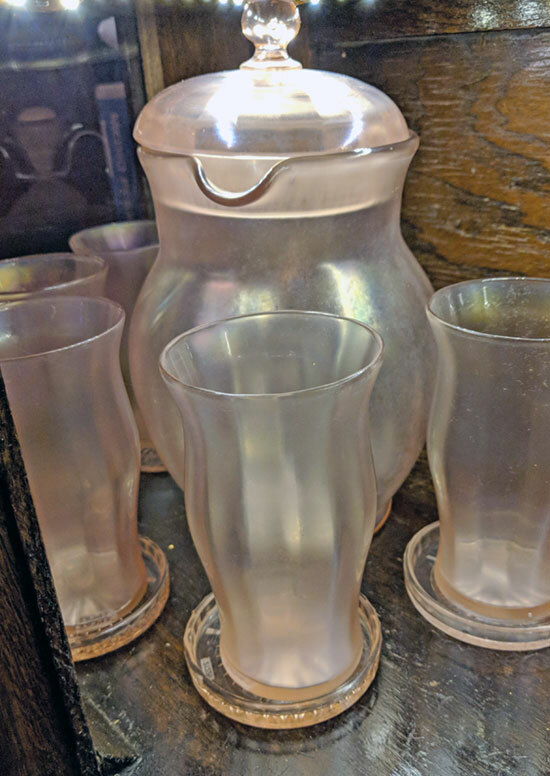 We refer to the shorter set as “squatty” or “bulbous.” I’m not sure there is a universal name for the taller pitcher; it has a mold number, #222, so let’s just go with that. I have heard it referred to as the “hourglass” shape, but it is not really shaped like an hourglass, so I’m not sure where that came from. 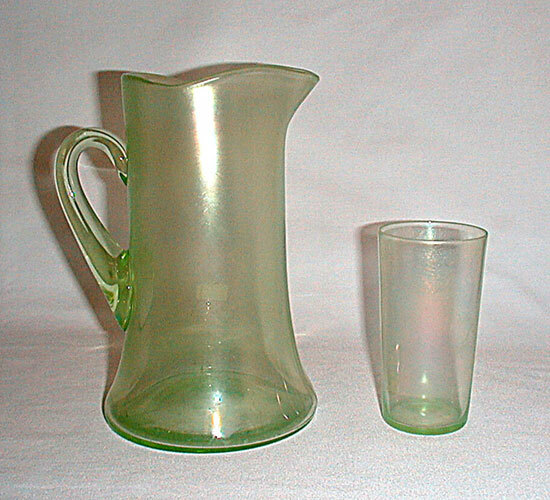 This pitcher does not have a cover, but it does have matching tumblers which are the same basic shape as the pitcher. 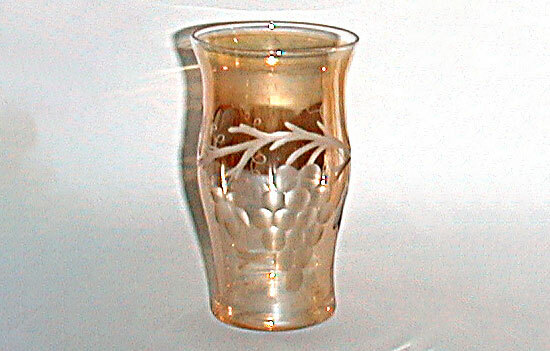 There are also mugs in this shape, the difference being the addition of an attached handle. Mugs and tumblers are not necessarily available in all colors. The squatty or bulbous pitcher came with a cover; it is pictured this way in the Fenton catalogs. They are found today without covers, but they should be considered “lid-less” if they do not have a cover. Usually the matching mug is the one shown in the “professional” photo. This mug flares at the top and then tapers to a narrow base. In Velva Rose I am not aware of handled mugs, so I use the #222 tumblers with both of the pitchers. Velva Rose (not iridized) coasters exist and go with these tumblers. I am not aware of a pink or Velva Rose base for the pitcher but it might exist. You will note the Velva Rose pitchers have pink handles. I am not aware of any handled piece of Velva Rose stretch glass which as a Cobalt handle; they all have pink handles. Please prove me wrong by sending us a photo if you have a Velva Rose handled pitcher with a cobalt handle. I’d love to see it. 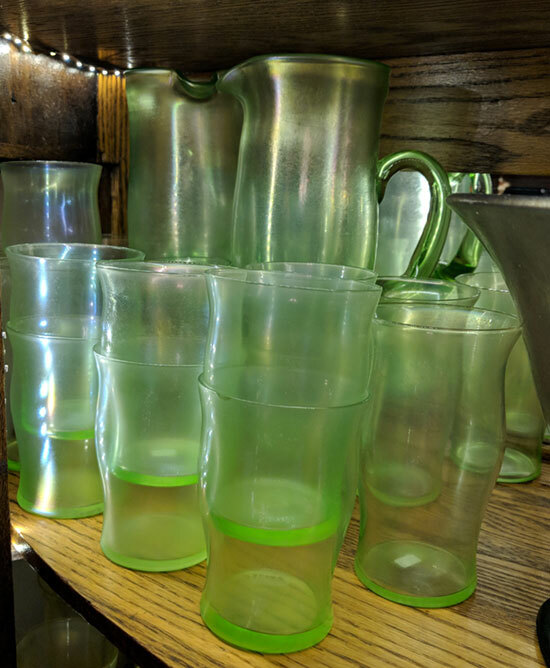 Another interesting point is that these mold-blown pitchers have not been found (again, to my knowledge) in Florentine Green. They are known in Topaz, Celeste Blue, Velva Rose and Wistaria. I’m not aware them existing in Persian Pearl or any of the other Fenton colors. If you have one in an unusual color we would love to see a picture of it. 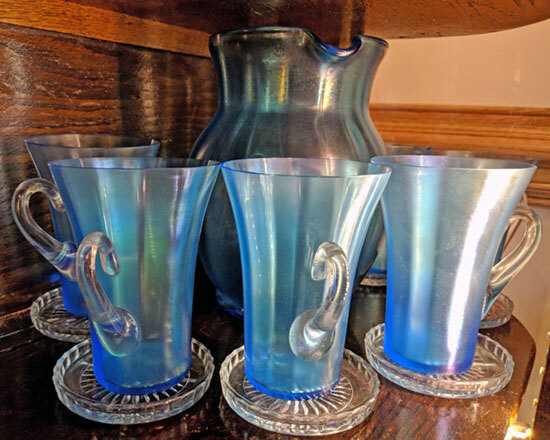 The Celeste Blue set is known with crystal handles and matching crystal coasters, again, no crystal base for the pitcher (yet). These sets, both tall and squatty, are known to have been wheel cut with a flower design. 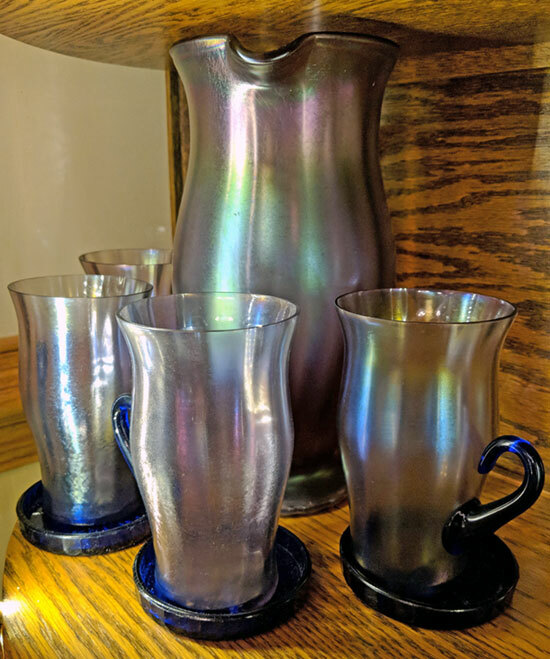 I have seen the tall and squatty pitchers and mugs in Wistaria with wheel cuttings and I have a set of Topaz mugs with the same wheel cutting. There is a matching pitcher in Topaz which I believe is the tall pitcher. When you consider all of the possibilities, there are many different sets which can be assembled. One other note, in Grecian Gold aka Marigold, the tall pitchers and #222 tumblers exist with extraordinary wheel cutting on them. Several sets were in the Fenton museum until the contents were sold. 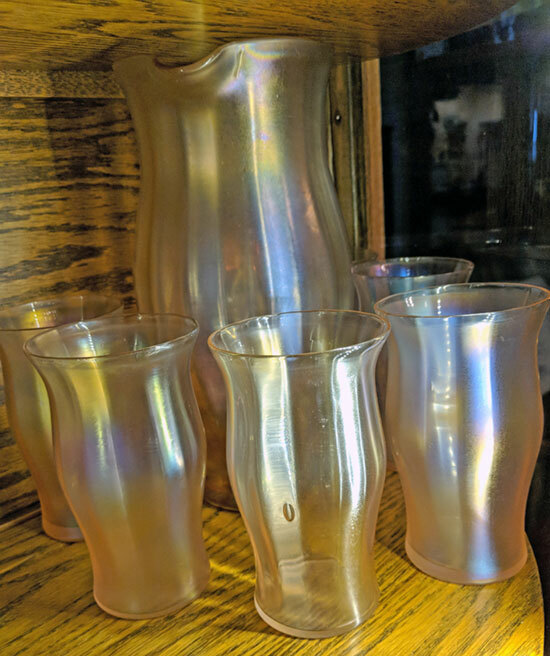 These are magnificent sets which I believe would appeal to carnival collectors as well as stretch glass collectors because the Grecian Gold is shiny, not like the typical softer finish found on stretch glass. 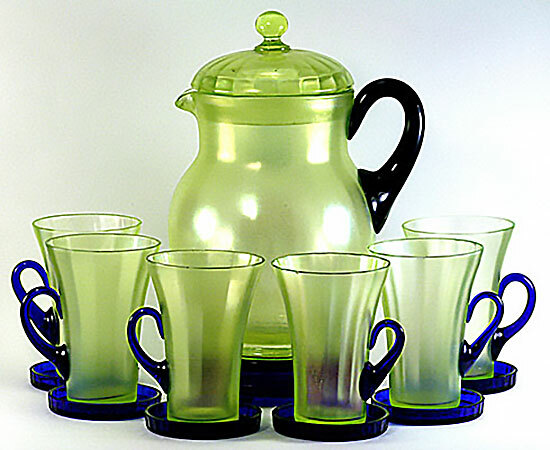 Other companies made beverage sets as well. Hopefully Dave or I can cover these on another Tuesday. Happy Thanksgiving to everyone and let me add that I am very thankful for all the work and enthusiasm Brian, Galen, Kathy, Dr. Glass and others devote to making this communication possible. Thanks to each of them for allowing The Stretch Glass Society to be a regular contributor.